This article is about the class of double sulfates of aluminium. For the specific representative compound, see potassium alum. For the chromium analogs, see chrome alum. For papermakers alum, see aluminium sulfate. For other uses, see Alum (disambiguation). 2O. Other alums are named after the monovalent ion, such as sodium alum and ammonium alum. 2O, which is used for most industrial flocculation. In medicine, "alum" may also refer to aluminium hydroxide gel used as a vaccine adjuvant. 2O) with potassium alum and other minor sulfates. A detailed description of a substance called alumen occurs in Pliny the Elder's Natural History. By comparing Pliny's description with the account of stupteria given by Dioscorides, it is obvious the two are identical. Pliny informs us that a form of alumen was found naturally in the earth, and calls it salsugoterrae. Pliny wrote that different substances were distinguished by the name of alumen, but they were all characterised by a certain degree of astringency, and were all employed in dyeing and medicine. Pliny says that there is another kind of alum that the Greeks call schiston, and which "splits into filaments of a whitish colour", From the name schiston and the mode of formation, it appears that this kind was the salt that forms spontaneously on certain salty minerals, as alum slate and bituminous shale, and consists chiefly of sulfates of iron and aluminium. One kind of alumen was a liquid, which was apt to be adulterated; but when pure it had the property of blackening when added to pomegranate juice. This property seems to characterize a solution of iron sulfate in water; a solution of ordinary (potassium) alum would possess no such property. Contamination with iron sulfate was greatly disliked as this darkened and dulled dye colours. In some places the iron sulfate may have been lacking, so the salt would be white and would be suitable, according to Pliny, for dyeing bright colors. Pliny describes several other types of alumen but it is not clear as to what these minerals are. The alumen of the ancients then, was not always potassium alum, not even an alkali aluminum sulfate. Alum and green vitriol (iron sulfate) both have sweetish and astringent taste, and they had overlapping uses. Therefore, through the Middle Ages, alchemists and other writers do not seem to have discriminated the two salts accurately from each other. In the writings of the alchemists we find the words misy, sory, and chalcanthum applied to either compound; and the name atramentum sutorium, which one might expect to belong exclusively to green vitriol, applied indifferently to both. In the early 1700s, Georg Ernst Stahl claimed that reacting sulfuric acid with limestone produced a sort of alum. The error was soon corrected by Johann Pott and Andreas Marggraf, who showed that the precipitate obtained when an alkali is poured into a solution of alum, namely alumina, is quite different from lime and chalk, and is one of the ingredients in common clay. 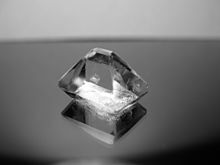 Marggraf also showed that perfect crystals with properties of alum can be obtained by dissolving alumina in sulfuric acid and adding potash or ammonia to the concentrated solution. In 1767, Torbern Bergman observed the need for potassium or ammonium sulfates to convert aluminium sulfate into alum, while sodium or calcium would not work. The composition of common alum was finally determined by Louis Vauquelin in 1797. As soon as Martin Klaproth discovered the presence of potassium in leucite and lepidolite, Vauquelin demonstrated that common alum is a double salt, composed of sulfuric acid, alumina, and potash. In the same journal volume, Jean-Antoine Chaptal published the analysis of four different kinds of alum, namely, Roman alum, Levant alum, British alum and alum manufactured by himself, confirming Vauquelin's result. Some alums occur as minerals, the most important being alunite. The most important alums – potassium, sodium, and ammonium – are produced industrially. Typical recipes involve combining aluminium sulfate and the sulfate monovalent cation. The aluminium sulfate is usually obtained by treating minerals like alum schist, bauxite and cryolite with sulfuric acid. Aluminium-based alums are named by the monovalent cation. Unlike the other alkali metals, lithium does not form alums; a fact attributed to the small size of its ion. 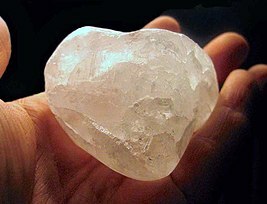 2O, also called "potash alum" or simply "alum". 2O, also called "soda alum" or "SAS". Aluminium-based alums have a number of common chemical properties. They are soluble in water, have a sweetish taste, react acid to litmus, and crystallize in regular octahedra. In alums each metal ion is surrounded by six water molecules. When heated, they liquefy, and if the heating is continued, the water of crystallization is driven off, the salt froths and swells, and at last an amorphous powder remains. They are astringent and acidic. Alums crystallize in one of three different crystal structures. These classes are called α-, β- and γ-alums. The solubility of the various alums in water varies greatly, sodium alum being readily soluble in water, while caesium and rubidium alums are only sparingly soluble. The various solubilities are shown in the following table. Aluminium-based alums have been used since antiquity, and are still important in many industrial processes. The most widely used alum is potassium alum. It was used since antiquity as a flocculant to clarify turbid liquids, as a mordant in dyeing, and in tanning. It is still widely used in the treatment of water, in medicine, for cosmetics (in deodorant), in food preparation (in baking powder and pickling), and to fire-proof paper and cloth. Sodium alum is used in substitution to potassium alum in baking powders. Ammonium alum has a few niche uses. Other alums have mostly research interest. In traditional Japanese art, alum and animal glue were dissolved in water, forming a liquid known as dousa (ja:礬水), and used as an undercoat for paper sizing. Alum in the form of potassium aluminium sulphate or ammonium aluminium sulfate in a concentrated bath of hot water is regularly used by jewelers and machinists to dissolve hardened steel drill bits that have broken off in items made of aluminum, copper, brass, gold (any karat) and silver (both sterling and fine). This is because alum does not react chemically to any significant degree with any of these metals, but will corrode steel. When heat is applied to an alum mixture holding a piece of work that has a drill bit stuck in it, if the lost bit is small enough, it can sometimes be dissolved / removed within hours. 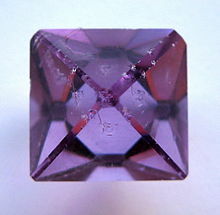 2O, a dark violet crystalline double sulfate of chromium and potassium, was used in tanning. In general, alums are formed more easily when the alkali metal atom is larger. 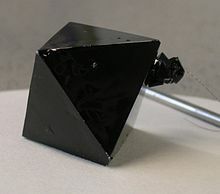 This rule was first stated by Locke in 1902, who found that if a trivalent metal does not form a caesium alum, it neither will form an alum with any other alkali metal or with ammonium. 4) instead. They are strong oxidizing agents. In some cases, solid solutions of alums with different monovalent and trivalent cations may occur. 2) "alums", tetrahydrates such as goldichite, monohydrates such as thallium plutonium sulfate and anhydrous alums (yavapaiites). These classes include differing, but overlapping, combinations of ions. 2O, where A is a divalent metal ion, such as cobalt (wupatkiite), manganese (apjohnite), magnesium (pickingerite) or iron (halotrichite or feather alum), and B is a trivalent metal ion. 5), B is a trivalent metal ion, such as aluminium, chromium, titanium, manganese, vanadium, iron(III), cobalt(III), gallium, molybdenum, indium, ruthenium, rhodium, or iridium. Analogous selenates also occur. The possible combinations of univalent cation, trivalent cation, and anion depends on the sizes of the ions. 2O, where A is a univalent cation, and B a divalent metal ion. 4, where A is a univalent cation and B is a divalent metal ion are referred to as langbeinites, after the prototypical potassium magnesium sulfate. ^ a b Austin, George T. (1984). Shreve's Chemical process industries (5th ed.). New York: McGraw-Hill. p. 357. ISBN 9780070571471. ^ "Alhydrogel | Alum vaccine adjuvant for research | InvivoGen". www.invivogen.com. Retrieved 2018-06-08. ^ Picon, M.; et al. (2005). "L'alun des oasis occidentales d'Egypte: researches sur terrain et recherches en laboratoire". In Borgard P.; et al. (eds.). L'alun de Mediterranée. ^ Archontidou, A. (2005). "Un atelier de preparation de l'alun a partir de l'alunite dans l'isle de Lesbos". In Borgard P.; et al. (eds.). L'alun de Mediterranée. ^ Hall, A. J.; Photos-Jones, E. (2005). "The nature of Melian alumen and its potential for exploitation in Antiquity". In Borgard P.; et al. (eds.). L'alun de Mediterranée. ^ Chisholm 1911, pp. 766-767. ^ Andreas Sigismund Marggraf (1754), "Expériences faites sur la terre d'alun" (Experiments made on the earth of alum), Mémoires de l'Académie des sciences et belles-lettres de Berlin, pp. 41-66. ^ a b c d Chisholm 1911, p. 766. ^ Marggraf (1754) "Expériences qui concernent la régénération de l'alun de sa propre terre, l'après avoir séparé par l'acide vitriolique ; avec quelques compositions artificielles de l'alun par moyen d'autres terres, et dudit acide" (Experiments that concern the regeneration of alum from its own earth, after having separating it by sulfuric acid ; with some artificial compounds of alum by means of other earths and the aforesaid acid), Mémoires de l'Académie des sciences et belles-lettres de Berlin, pp. 31-40. ^ Martin Heinrich Klaproth (1797), Beiträge zur Chemischen Kenntniss Der Mineralkörper (Contributions to [our] chemical knowledge of mineral substances). Decker and Co., Posen, and Heinrich August Rottmann, Berlin; pp. 45-46 and p. 193. ^ Martin Heinrich Klaproth (1801), Analytical Essays Towards Promoting the Chemical Knowledge of Mineral Substances. T. Cadell, Jr. & W. Davies, London. His finding of potassium in leucite appears on pp. 353-354.: "On the contrary, I was surprised in an unexpected manner, by discovering in it another constituent part, consisting of a substance, the existence of which, certainly, no one person would have conjectured within the limits of the mineral kingdom … This constituent part of leucite … is no other than pot-ash, which, hitherto, has been thought exclusively to belong to the vegetable kingdom, and has, on this account, been called VEGETABLE ALKALI. — This discovery, which I think of great importance, cannot fail to occasion considerable changes in the systems of natural history, … .". The discovery of potassium in lepidolite is mentioned on p. 472. ^ Vauquelin (1797) "Sur la nature de l'Alun du commerce, sur l'existence de la potasse dans ce sel, et sur diverses combinaisons simples ou triples de l'alumine avec l'acide sulfurique". In Annales de Chimie et de Physique, 1st series, volume 22, pages 258-279. ^ Jean-Antoine Chaptal (1797), "Comparée des quatre principales sortes d'Alun connues dans le commerce; et Observations sur leur nature et leur usage". In Annales de Chimie et de Physique, 1st series, volume 22, pages 280-296. ^ a b Chisholm 1911, p. 767. ^ Nancy Lee (6 August 2013). The Complete Idiot's Guide to Making Metal Jewelry. DK. p. 114. ISBN 978-1-61564-370-7. ^ J. Locke (1902). "On some double suphates of thallic thallium and caesium". American Chemical Journal. 27: 281. ^ Bell, Chichester H. (1887). Summarizing original article by C. Fabre (Compt. rend., 105, 114–115). "Selenium Alums". Abstracts of chemical papers. Inorganic chemistry. Journal of the Chemical Society. LII. Part II. : 1014. Retrieved 2017-08-19. ^ Greenwood, N. N.; & Earnshaw, A. (1997). Chemistry of the Elements (2nd Edn. ), Oxford: Butterworth-Heinemann. ISBN 0-7506-3365-4. This article incorporates text from a publication now in the public domain: Chisholm, Hugh, ed. (1911). "Alum" . Encyclopædia Britannica. 1 (11th ed.). Cambridge University Press. pp. 766–767. Look up alum in Wiktionary, the free dictionary. The alkali metals are a group (column) in the periodic table consisting of the chemical elements lithium (Li), sodium (Na), potassium (K), rubidium (Rb), caesium (Cs), and francium (Fr). This group lies in the s-block of the periodic table of elements as all alkali metals have their outermost electron in an s-orbital: this shared electron configuration results in their having very similar characteristic properties. Indeed, the alkali metals provide the best example of group trends in properties in the periodic table, with elements exhibiting well-characterised homologous behaviour. Hydroxide is a diatomic anion with chemical formula OH−. It consists of an oxygen and hydrogen atom held together by a covalent bond, and carries a negative electric charge. It is an important but usually minor constituent of water. It functions as a base, a ligand, a nucleophile, and a catalyst. The hydroxide ion forms salts, some of which dissociate in aqueous solution, liberating solvated hydroxide ions. Sodium hydroxide is a multi-million-ton per annum commodity chemical. A hydroxide attached to a strongly electropositive center may itself ionize, liberating a hydrogen cation (H+), making the parent compound an acid. In chemistry, a salt is an ionic compound that can be formed by the neutralization reaction of an acid and a base. Salts are composed of related numbers of cations and anions so that the product is electrically neutral. These component ions can be inorganic, such as chloride (Cl−), or organic, such as acetate ; and can be monatomic, such as fluoride (F−), or polyatomic, such as sulfate. Sulfuric acid (alternative spelling sulphuric acid), also known as vitriol, is a mineral acid composed of the elements sulfur, oxygen and hydrogen, with molecular formula H2SO4. It is a colorless, odorless, and syrupy liquid that is soluble in water, in a reaction that is highly exothermic. 4. Sulfate is the spelling recommended by IUPAC, but sulphate is used in British English. Salts, acid derivatives, and peroxides of sulfate are widely used in industry. Sulfates occur widely in everyday life. Sulfates are salts of sulfuric acid and many are prepared from that acid. Jarosite is a basic hydrous sulfate of potassium and iron with a chemical formula of KFe3+3(OH)6(SO4)2. This sulfate mineral is formed in ore deposits by the oxidation of iron sulfides. Jarosite is often produced as a byproduct during the purification and refining of zinc and is also commonly associated with acid mine drainage and acid sulfate soil environments. Sodium sulfate (also known as sodium sulphate or sulfate of soda) is the inorganic compound with formula Na2SO4 as well as several related hydrates. All forms are white solids that are highly soluble in water. With an annual production of 6 million tonnes, the decahydrate is a major commodity chemical product. 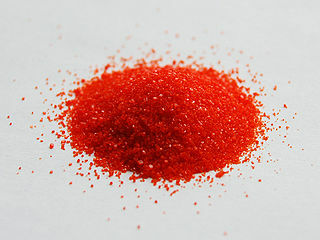 It is mainly used for the manufacture of detergents and in the kraft process of paper pulping. Potassium alum, potash alum, or potassium aluminium sulfate is a chemical compound: the double sulfate of potassium and aluminium, with chemical formula KAl(SO4)2. It is commonly encountered as the dodecahydrate, KAl(SO4)2·12H2O. It crystallizes in cubic structure with space group P a -3 and lattice parameter of 12.18 Å. The compound is the most important member of the generic class of compounds called alums, and is often called simply alum. Ammonium sulfate (American English and international scientific usage; ammonium sulphate in British English); (NH4)2SO4, is an inorganic salt with a number of commercial uses. The most common use is as a soil fertilizer. It contains 21% nitrogen and 24% sulfur. Aluminium sulfate is a chemical compound with the formula Al2(SO4)3. It is soluble in water and is mainly used as a coagulating agent (promoting particle collision by neutralizing charge) in the purification of drinking water and waste water treatment plants, and also in paper manufacturing. Sodium dithionate Na2S2O6 is an important compound for inorganic chemistry. It is also known under names disodium dithionate, sodium hyposulfate, and sodium metabisulfate. The sulfur can be considered to be in its +5 oxidation state. 6. It is a colorless liquid rarely encountered undiluted. Hexafluorosilicic acid has a distinctive sour taste and pungent smell. It is produced naturally on a large scale in volcanoes. It is manufactured as a precursor to aluminum trifluoride and synthetic cryolite. It is commonly used as a source of fluoride for water fluoridation. Salts derived from hexafluorosilicic acid are called hexafluorosilicates. Ammonium aluminium sulfate, also known as ammonium alum or just alum (though there are many different substances also called "alum"), is a white crystalline double sulfate usually encountered as the dodecahydrate, formula (NH4)Al(SO4)2·12H2O. It is used in small amounts in a variety of niche applications. The dodecahydrate occurs naturally as the rare mineral tschermigite. Chromium(III) sulfate usually refers to the inorganic compounds with the formula Cr2(SO4)3.x(H2O), where x can range from 0 to 18. Additionally, ill-defined but commercially important "basic chromium sulfates" are known. These salts are usually either violet or green solids that are soluble in water. It is commonly used in tanning leather.